Like most book geeks I have a wish list on Amazon for the benefit of those wishing to bless me with books. So, this year I received two books from the list plus a third not on the list. All three dealt with the Revolutionary War. Two deal with the British side of the American Revolution. The first book, With Zeal and Bayonets Only by Matthew H. Spring illustrates the challenges the British Army faced in trying to put down a colonial rebellion. The numbers are interesting. At no time did the British and German Regulars in North America number more than 35,000 soldiers spread out over a rather large area. Approximately 250,000 Americans took part in fighting these Regulars although most of them served in short term enlistments. The war which was a civil war as well as a rebellion was fought over terrain quite unlike Central Europe. The British adopted their methods quite effectively and Spring’s book puts to death the myth of the stealthy American rifleman picking off mindless Redcoats as they plodded along in an unimaginative way. I’m about 1/2 of the way through and find it interesting to see aspects of the Revolutionary War through the eyes of the British. Yes Britain lost but it sure was not for lack of commitment or bravery from the Redcoated Regulars. The second book, Fusiliers by Mark Urban (also a British author) details the Revolutionary War experiences of the 23rd Regiment of Foot otherwise known as the Royal Welch Fusliers. The Regiment is unique having been at Lexington and Concord and ending the war at Yorktown. According to the author he selected the 23rd because it served throughout the conflict and there is abundant information regarding it’s service. There are not many regimental histories from the period so this should be interesting. 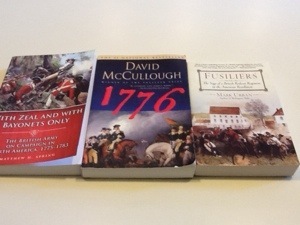 The last book is David McCullough’s 1776. It was a 2005 national best seller and McCullough won a Pulitzer for it. For some inexplicable reason I did not purchase the title when it was hot but always kept it in the back of mind. Fortunately, my son’s mother-in-law picked it up at a used book sale and it became my third Revolutionary War read for 2015. This is assuming that I do not get side-tracked by other books for other periods of history. No I have not but it looks interesting. I think I’ll mark it. It’s the kind of thing I like, more about the common soldier and human interest stuff. As for “With Zeal and Bayonets Only” it’s a little different although the author uses original source material liberally. But I wouldn’t say it’s heavy on human interest. It’s more about how the British Army adapted intentionally to the circumstances in America and in that sense a bit of an apologetic (meaning defense) of why they lost the war while winning most of the battles. It’s heavy on the point of view of officers who had to manage changing military doctrine, officers like Howe, Cornwallis, Clinton, Burgoyne and Tarleton. Just a bit of heads up if you are looking for more of a human interest type thing. Thanks for the blog tip and for stopping by and Happy New Year! Ah, that’s too bad. In that case I think I would find it more of a chore to read than a form of enjoyment and will have to pass on it. Thanks for the info, Bruce! I’m almost done with it. It’s a period of interest for me so I didn’t mind it but on the other hand there are other things I would have rather invested in. It’s well written, just not quite what I expected. Wish I were a faster reader! The American Revolution is probably one of the most mythologized and misunderstood wars of the past 250 years. McCullough’s book does a good job showing just how close we came to losing the war in its first full year, though you’d never know from most Americans’ grasp of the conflict. It was an incredibly divisive war that was years, if not decades, in the making, and that the Colonies defeated the British still has to be considered one of the great upsets of history. Thanks for the tip on the other two books; I’ve not seriously pondered about the Revolution from the other viewpoint and it should make for a good read. My interest in the RW dates back to 1976 and my miniature wargaming days. I read just about everything I could and knew then that at the popular level accurate information was lacking and mythology prevailed. With Zeal and Bayonet Only is a detailed study of the British Army during the time period. It’s not the human interest book I was looking for but does give a feel for the uniqueness of the war in the American colonies. There are a couple of items I may write a post on including the Civil War aspect of the RW. I expect the book on the 23rd Foot to be more about the individual soldier’s experience. Not sure why I never picked up McCullough other than to surmise I jump around a lot with my historical interests. Thanks for stopping by and keep up your good work!